If you need something to listen to this Friday, check out the Tasteful Profanity podcast. I was invited on to talk about the draft and was also warned to expect some ‘off-the-wall’ questions. There are most definitely some of those too. I’m not often lost for words so this was a unique experience for me. Give it a listen and if you want to subscribe to the podcast via Itunes, you can do so by clicking here. Great podcast. You are a star in your personal brand is growing and growing! Its very exciting seeing you venture out to other communities and especially not limiting your podcasts to Kenneth Arthur only. I really loved your podcast with the Hawkblogger crew! Rob, Fellow Draft Blog Community, I saw on Akrum Wadley’s Instagram he was training for Pro Day/ Combine with none other than Kerryon Johnson! Both were at an Exos facility in Florida. Thanks Stevie, appreciate the kind words! Wadley is small but very dynamic. Fun player. Rob, G-Scott (10-12 with John Clayton) and and Brock Huard (Brock and Saulk) have both talked up Price…. G-Scott sometimes has the inside scoop on the Seahawks due to his ties within the organization and Huard due to his frequent back and forths with players on the team. I think they did a segment with Brock from 07:45 to 0800 ask 4 football questions… and the question was about who would be a guy Seattle would pick at #18 we are not talking about enough (paraphrased) and he mentioned Price as his guy to really watch closely. He has heard from some “sources” round the league that Price is considered one or if not the best interior OL in the draft. He would be viewed as a center in the NFL, not a guard per sai…. but he has great strength and command of the OL…. and fits a ZBS system that solari might be running. Wish I could remember the couple of times they talked about him recently…. the last time was Tuesday ro Wednesday this week…. he also mentioned he will put on a show at the combine. (and might go earlier than #18 if he does what scouts think he can). Gee absolutely has connections in the organization, though he hasn’t been right 100% of the time. I do think Pete (and plenty of other coaches) will love him, if his leadership and character at half what they are cracked up to be. What I found interesting was that they (scouting community) viewed him as a 10 year starter in the league.. .a guy you could build around.. and he would be cost controlled for 3-4 years… enabling investment in other parts of the team. You would be getting a great value for his skills and abilities. I’ve seen this idea floated around recently and am not sure who started the whole “trade Britt” whispers or why they seem to think it’s a good idea. Guess I don’t get it really. He’s still only 26 and has a cap hit of just $6.1m this year and $7.9m next year. With the way the OL market has gone this past year and looks to continue to trend, that is a steal for a young, healthy, solid to slightly above average center who still has time to grow. Why give that up to create another hole on the interior OL when we already have one we need to fill? Is any team really going to give up a day 2 pick for him anyway? Even then, is it worth it? Not for me. Perhaps they believe Pocic is best suited for Center (he was drafted as a Center, who could play other positions) and Pocic is also cheaper. I just don’t think they can rule anything out right now, aside from having Duane Brown etched in stone as the Left Tackle. Every other position is up for grabs, imo. I’d agree that Britt would be assuredly be our Center in ’18 had it not been for the fact they drafted Pocic. Who knows? I don’t think any of us do right now. It’s going to be especially interesting to me to see what Solari can do with Ifedi. Can’t rule anything out, but it’s crazy to me to trade an established, solid, young, reasonably priced lineman in a league where that is getting harder to find every year. He’s not a stud, but Britt is valuable. It’s reassuring to read Brock is saying the same as we have about Price. What a top prospect he is. That is likely part of why we have seen no interviews, presses, and so on from any of the new hires. As long as we’re speculating, when Pete started in Seattle he brought with him a revised approach to the game, particularly with his DBs, that was subsequently copied. Is he now revising his approach, this time on the offensive side? Honestly, I doubt it. His hires already say he is just going to go back to what he has always wanted to be. So in my mind, draft targets are the same. Fun read. Lots of Hawks action. I like the idea of targeting JuWuan James after he gets cut, Lets turn back to back Dolphins 1st round busts into back to back reclamation projects LOL. How funny would that be? Also got the idea of tagging and trading Sheldon Richardson to Chiefs for Spencer Ware. In my mind he might as well be named Carlos Hyde, and if we can actually get paid to acquire him, why the heck not? Cameron Brate would be a perfect fit, I’m a big fan of his but I don’t think TB would let him go easy. Great podcast, as always. I can’t help but get excited about Smythe and Schultz. A true 3 down TE who can run, block, and catch is a beautiful asset. Seems likely that they are both good enough that you probably need to spend a third to be sure one. Not to be a broken record, here, but there is another blocking TE in David Wells, SD St, who might be available later. Tony Pauline referenced him as like another OT, and can catch. It has been frustrating to find tape, though. Thanks for being a broken record, as I had recalled that you had mentioned another TE, but had thus far been too lazy to go back and search for the name. Not a lot of cut ups on any of these guys, though at least for Schultz and Smythe, you can watch their respective running backs. Looking forward to watching some Wells. Listening to Rob reminisce about the pre YouTube days was a reminder of what things used to be like. If you didn’t watch a ton of football you pretty much had to listen to Kiper and the few other draft media guys to get much insight into these prospects. I’m grateful for the incredible ease with which we can access cut up videos of these players. And I suppose you can watch Wells in Penny’s cutups. He’s a pretty big dude – SD State lists him at 6’5” 255. My first impression is that he’s a very good inline blocker. Not necessarily great when he’s got to get to the second level and block someone in space. A bit lumbering as a runner. Definitely a player worth monitoring. Hopefully more video surfaces. Thanks. I am not promoting the guy, but if we can score a late round Y TE, then I am interested. Still hoping to see more film. So Richard Sherman says he is very confident he’ll be back with Seattle next season, also feels he’ll be ready for camp. I think it’s 50/50 whether he’s back. It might hinge on if they reach a settlement with Chancellor and or move Thomas. If neither of those happen, Seattle will probably be pretty hampered financially to make many free agency moves, and Sherman would be a logical person to move. Richard Sherman off-season 2017… he’s a stud and about the best CB in the NFL. Lots of chatter. Can’t cut someone that great and won’t get value for him even for a 1st round pick (and nobody would offer two of those). Richard Sherman off-season 2018… he’s going to make over $12 million or something in ’18 but it’s not guaranteed. He’s hurt. He’s humbled and wants that contract. In ’17 he felt he could spout off what he wanted (I think of the two different/major times he spouted off), in ’18 he’s humbled by the contract and his being hurt. Now he wants to keep that contract because nobody will give a hurt player like that that much in all probability. How things can change in only a year. NFL = Not For Long. Not related to anything but the 49ers went 6-10 last year, 5 wins came after Garropollo. The 49ers lost 5 games by a field goal or less last year. They will be a force to be reckoned with this year and in the future. We need to get young and hungry. Can’t have the Rams and 49ers spoiling our dominance. My apologies in advance if you find this post a little long. Happy Weekend reading! I am a proud Canadian and loyal 37 year Hawks fan. Canada is sports mad country but the passion here is hockey we are a rabid hockey fans as Americans are football fans or Brits are Soccer / Football fans. Baseball would be sport number two and in recent years Basketball has risen in prominence with Canadian NBA stars like Steve Nash and now Andrew Wiggins. As a result most of the top athletes in Canada growing up play hockey or basketball in winter then baseball or soccer in summer. Football is a seasonal sport in the fall for the two months of Sept and Oct which kids normally start playing in High School. By that time the elite athletes are often not allowed to play by their hockey or basketball coaches for fear of injury. So why am I giving you this background. Well it is because despite this almost every year at least one Canadian kid despite the long odds ends up getting drafted in the mid-rounds based on nothing but pure athleticism and potential. Once they do however the success rate of this long shots is incredibly high however and we have discussed at least one guy each year here on the blog. All these guys are still in NFL and despite not being stars or household names have been solid contributors. Of them all I thought Onyemata had the most upside and he is just getting better each year next to Sheldon Rankins in NO. This year the Canadian kids I want to highlight to the blog is my favorite so far no doubt his name is Nathan Sheppard a DT from Fort Hayes St.. He is a guy absolutely no one was talking about before the Senior bowl but after Day #1 had the scouting community in full on “who is this guy” mode. He looked amazing at the weigh-ins at 6-4” 310lbs/ 10 inch hands and 33 inch arms he looked like the prototype 3 tech with a huge frame that could add more quality bulk if necessary. Then on Day #1 he went out and absolutely dominated which is amazing when you consider he was a D2 player. So much for a required adjustment period. He was even cleanly beat one of my favorite guards in this draft class Wil Herandez on a couple of reps. Almost all of the talking heads and bloggers had him as one of the Day #1 winners and risers. Shepherd destroyed the North team offensive line time and time again. He won with speed, power, and technique. He started out with the same dominance on Day #2 but unfortunately broke his hand and could not finish Day #3 practices or the game. Still the scouting community is now fully aware of Sheppard with talk of him eventually even becoming a Day #2 pick. Still I think 4-5th round is more likely but he is going to the combine where I think he will be a great tester based on the explosive traits he shows. If he blows up there then who knows perhaps 3rd round is not out of the question. I was impressed with what I saw of him from the Senior Bowl so started digging deeper and what I uncovered about his character and perseverance was equally or more impressive than anything he showed on tape. His back story is awesome and based on this alone I think he would have to be on the Hawks radar. Or at least I hope so. I want to share some of his remarkable story. For the Seahawks we know the background of these players is just about as important as what they show on the field. For Nathan Shepherd, the path to the NFL has certainly not been an expected or easy one. He grew up in Ontario, Canada, and played his collegiate year at Simon Fraser University in Canada. He started off by playing linebacker and was asked to transition to the defensive line. At that point he was only 6-foot-1 and weighed 205 pounds. He was asked to play on the scout team at defensive end. Over the next year, he was able to gain about 50 pounds and go from playing defensive end to defensive tackle at 250 and started every game his second year. Unfortunately for Shepherd, he ran into some financial hardships as Canadian schools cannot offer the type of full athletic scholarships available in the US. He had to leave the college and find work. Shepherd started working some odd end jobs such as working at a plant nursery and did some electrical construction, following in his father’s footsteps. As time went on, Nathan continued to bounce around a bit, finding work and trying to take some community college classes along the way. In 2014 he had some of the junior colleges in the area reach out to Fort Hays State and recommend that they contact him. Thankfully, they listened and called him up, but at that time could not offer him a scholarship.So Shepherd took a risk and moved down to Kansas and walked on at their football program. It didn’t take long though, for the coaches to see the talent and he was offered to be on scholarship. He became the true leader or that Fort hays team by all accounts and was able to finish his degree. That alone would be a great story but now Sheppard is looking like a player that will quickly climb up NFL Draft boards leading up to April and if his combine results are anything like his Senior Bowl he is going to be the type of raw athlete an NFL DL coach would love to get his hands on. Here is a link to an interview he did after the Senior Bowl so you can get a feel for the type of kid he is. Teams are going to learn how hard this kid has had to work to earn everything that he has at this point. That will be a big selling point, knowing he will continue to work to prove he belongs. At 6-foot-4, 310 pounds, Shepherd finished the season with 38 tackles, 12.5 for a loss, and four sacks. Shepherd earned Defensive Player of the Year honors in the MIAA conference and was the building block of a stout defense that led FHSU to a MIAA Championship and an undefeated regular season. While the stats don’t necessarily pop off the page, the tape certainly jumps off the screen. As well all know here on the blog unless you are Vol 12 It’s difficult to find any information on the under-the-radar draft prospect, but I managed to find Shepherd’s clips on Hudl a couple on youtube and a game against East New Mexico State at the end of the 2016 season. 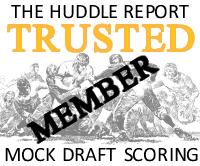 I have posted some links below as well as some bloggers scouting reports. On film, Shepherd was dominant against clearly inferior competition form a physical standpoint. He was impossible to block and disrupted the triple option attack all night, likely giving the opposing fullback nightmares of a slamming into a brick wall every time he ran up the middle. The thing I was most impressed with was his motor. It was incredible for a guy his size who never came off the field and was double teamed on basically every play. Also we know Pete loves his DTs to be gap discipline and Sheppard appears to excel in this area. He looks like a fierce competitor who goes hard on every snap through the whistle. Are there flaws. Of course he is raw and needs to work on pad level, hand usage etc. but the traits, size, speed and first step acceleration are all elite. He is the raw clay that could become something really special. Here are some more links with Tape on Sheppard. Conclusion, I think Sheppard has the potential to be a dominant 3 tech in the NFL. He is an explosive athlete with ideal size and a great motor. He will likely not start year # 1 as he adapts to speed of NFL but I think by year #2 will be a major contributor wherever he goes. I think he would be a fantastic option for the Hawks with our 4th round pick if he lasts that long and a great addition to the DL rotation and in the Hawks locker room. Would love to see another Canadian on the Hawks with Willson and Ryan who could both be gone this off season. Unlike Ryan and Willson however I think Sheppard has the upside potential to be a star. I look forward to hearing what people think of Sheppard, perhaps I am being overly biased in my assessment but I don’t think so. Wow, great write-up, Trevor! Thanks for taking the time to dig in and sharing this info with us. I have not watched him yet, but did hear the vibes constantly as I monitored the Senior Bowl action. I think we can be sure that PC/JS will not rest until they find their big, disruptive 3-tech! Maybe this is the guy. Wish him all the best with a great backstory like that. Fantastic write up, Trevor. I definitely have Sheppard on my radar for the Hawks. I’ve mocked him to Seattle a few times. Pretty confident they’ll be looking at the position again this year with this class. Sheppard feels very Seahawky. I could see him going sooner than 4th round, I think he’s a day 2 guy based on some of the draft analysts I’ve been listening to. Just read that the Seahawks have fired their assistant DB coach. Guess the table is prepared for Kam retiring and taking over letting the Hawks off the hook apart of the 6,8 mil guaranteed. nope. He already had his contract guaranteed Friday. Just a matter of whether or not they will have to pay him a guaranteed $5.2 million next year due to injury. Can’t do a deal where they pay him a lot of money to be a coach and not pay him his contract. That is a salary cap violation. There is still a chance he can play next year. Very slim. If he plays and is healthy, they can release him and not pay the guaranteed $5.2 for next year. But a lot of ifs in the whole situation. Thank you Hawk Eye for the info. Didn’t know that. Academically ineligible all of his Jr. season (2016) due to an administrative error, came back this year and ran for 155att/1011yds/9TD at a 6.5 ypc avg. Added 26/241/1TD receiving as well. Mature interview (he will turn 24 in July), team leader, and the right attitude for a RB: headhunter. Finishes runs. Build is a little tall, but shows surprisingly good jukes (quick feet), good balance and pad level. Good patience and vision, mostly just plants and goes, though he occasionally does get caught dancing around the LOS. Has the speed to bounce the run outside, as displayed vs. Alabama. Was a 4 star prospect out of HS, had at one point committed to Auburn. They say his long speed was affected by a lingering foot injury all year, so we’ll see how he tests at the combine. Definitely more than willing in pass pro and usually quite good for a RB. Cuts oncoming blitzers well. I did see 1 sack on him vs. Miss. St. (was 1v1 with a DE though and the ball was held too long by QB). All in all, this guy should probably be talked about in the R3-R4 range I think (maybe earlier if the RB class weren’t so deep), which might just make him all the more interesting for Seattle if they like him. It can be a bit hard to take too much from some of these highlight videos, but Wilkins looks interesting. From very limited viewing he keeps a nice low center of gravity, is capable of getting his pass really low, and has some legit agility. There are several backs I need to watch a lot more of (such as Kelly). Wilkins is one to keep on the radar. Intersting guy. Reminds me of Fred Jackson. Diverse skills. Seems like it’s all about the combine or pro day for a future in Seattle. I have listened both podcasts and i had to say that i enjoyed much more in the one on field gulls. And it is not because of you. You were great on both. 1. Price or Wynn at 18? 2. Your thoughts on Tevin Coleman as seahawks RB and would you trade some wets for him? I most certainly do! I remember Stefanovic and Dark Kovacevic signing for Sheff Wed at the same time. 1. I honestly cannot split Price and Wynn. Both exceptional talents IMO. 2. I think it’s best to focus on the draft at RB. I think we ALL can agree. The Seahawks three biggest needs are 1) Running back. 2) defensive line 3) offensive line. I also think if the Paul Richardson leaves that will also be a problem. I would argue that receiver is just as big of a need as RB, OL, DL with Richardson/Graham not expected back. Baldwin, Lockett, and Vannett as the three main targets? That’s a worse group than Brown, Pocic, Britt, Ifedi, and whatever else clown they could go with on the current roster and only a short step up from the current RB situation. The Hawks need to throw to their running back’s more often. Also the Hawks didn’t throw many screen passes to their running backs. Here is another point. Russell Wilson needs to concentrate more on getting first downs. Russell Loves the big play (who doesn’t) but it is just as important to throw check down passes especially on third down. You MUST keep the chains moving. I want to emphasize that fact. That is one reason why Tom Brady is a Hall of fame QB. Brady knows how important it is to move the chains. The passing offense is set-up for Brady to make mostly 3 step drop throws… to Gronk, Edleman or whoever is in the slot. He rarely goes outside the hash… the Seahawks offense was set-up to emphasize the run, then beat the LB/S over the middle and up the hashes… 10-15 yard passes…. I do agree, the RBs need to be more involved in the screen game.. and the OC they brought in loves these types of plays. ie: Stretch the defense vertically and horizontally. I actually think Graham might be a very nice fit in the revamped offense…. if you could get him for 7M a year… I would make that deal… over PRich at 6M a year. Not to change the subject. One reason Bill Belichick is so successful is because is doesn’t over pay for players. Can anyone remember when Belichick overpaid for a player. Yes Belichick paid handsomely for Revis. But it turned out to be a one year deal. If you are looking for a fat multiple year deal you can forget New England. Belichick is not afraid to kick his players to the curb. Belichick almost NEVER makes a bad trade. Belichick is not afraid to kick his players to the curb. Another point Belichick almost NEVER makes a bad trade. Another remember when the Hawks traded for Dion Branch. How did that deal work out for Seattle? Also how did the Richard Seymour trade work out for the Raiders. Speaking of New England it sure wouldn’t hurt for Seattle to incorporate much of their offensive playbook into their offense.